When you see designer bags on Instagram and Pinterest, the owner of the insanely beautiful bag is usually all legs, wearing the most coveted of outfits and skyscraper heels, with the air of having just stepped off the catwalk, en route to their next Fashion Week show. You rarely see a designer bag in a casual context with straight-out-of-bed-hair. Until now that is. Lazy weekends mean I want to be comfortable in what I'm wearing. My go to weekend staple has to be denim shorts and a tee and / or knitwear. This sort of outfit is great for lazying around the house in, or heading down the road to pick up groceries / going to the post office / other boring aspects of adult life. Simple but effective. 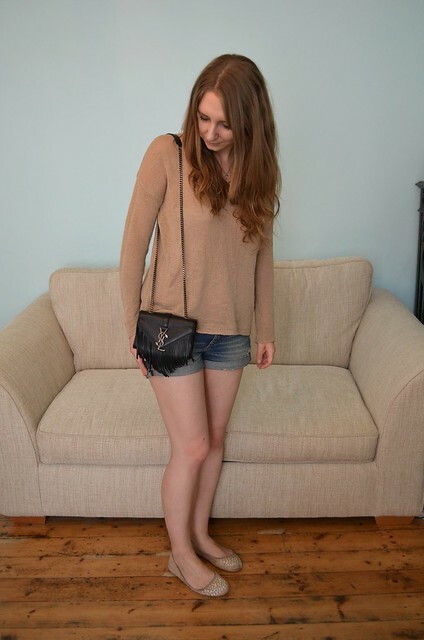 My favourite piece of knitwear I own has to be this sandy coloured number (just £13!). It's fairly light-weight compared to other knitwear which makes it a great transitional piece for spring / autumn / typical British weather and is great for layering with. It's also slightly over-sized which I love as it means it can hang off one shoulder all sassy like. Another personal favourite is this chunky khaki knit. It's not a colour I'd usually go for (it's not black, white or grey for starters! ), but it's a lovely deep forest sort of green and looks ace worn with blue denim. I just genuinely love Forever 21 and I do pick up 90% of my knitwear from there. So there you have it. Two looks with a designer bag in a more casual context. Next time I am taking casual to a whole other level, exploring if designer bags and pyjama chic are a marriage made in heaven or not... so it will be interesting gauging your reactions on that one! Do you like designer bags styled in a more casual way? Or do you prefer a glossier look? * A huge thanks to Farfetch for the bag of my dreams! Love a really simple outfit with a bag that stands out. Loving the fringe detailing on your purse!